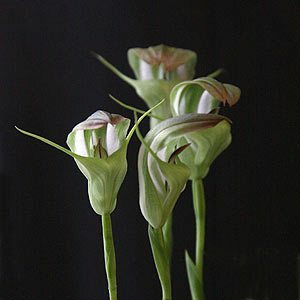 Pterostylis baptistii is a terrestrial orchid commonly known as the King Greenhood. Found widely in New South Wales, Victoria as well as in Queensland. This is one native orchid that is fairly easy to grow. With a largish flower that can reach around 5 – 7 cm in length, hooded with two sepals that give it that extra shape, this is a very attractive species. 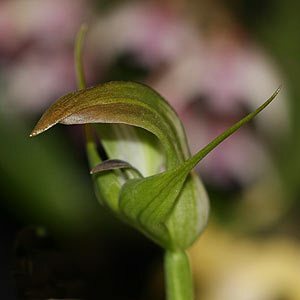 Distinguished by the pronounced green and red to brown hood, this is a fairly large orchid reaching around 25 to 30 cm in height in good conditions. This is an Australian native orchid that is found naturally occurring in moist areas in coastal sclerophyll forests, it is a species that takes well to pot culture and is a favorite with native orchid enthusiasts. Pterostylis baptistii is one species that requires constant moisture during the growing season. It is naturally found in semi open woodland conditions. As soon as it dies back cut back on watering and do not recommend regular watering until signs of life appear again in autumn. Overtime, in good conditions Pterostylis baptistii will spread to form a little colony, and in cultivation this can be achieved in a well drained moist soil in dappled shade. Check regularly for overly dry soil while dormant as total dryness will be a problem.